Stephen King’s busier than ever these days. He’s got numerous books on the horizon, film adaptations of It, The Dark Tower, and Gerald’s Game, and whatever J.J. Abrams’ Castle Rock ends up being, in the works. Although there’s never been a shortage of King in pop culture, nostalgia certainly plays some factor in this recent influx, as the people behind these cameras likely came of age while reading King’s work beneath covers with a flashlight. The paperback editions they read are just as likely to conjure that nostalgia as the work itself, as the slick, muted paperbacks of today look nothing like the exploitative ones of the ’70s and ’80s. It’s those early editions that graphic designer Butcher Billy is honoring with his latest collection, which envisions bygone love songs, ranging from Joy Division’s “Love Will Tear Us Apart” to The Smiths’ “There Is A Light That Never Goes Out” to George Michaels’ “Careless Whisper,” as novels in that same pulpy fashion. This series imagines an alternate universe in which some of the most hopeless, desperate and tragic heartbreak songs of the 70’s and 80’s were actually novels written by Stephen King. 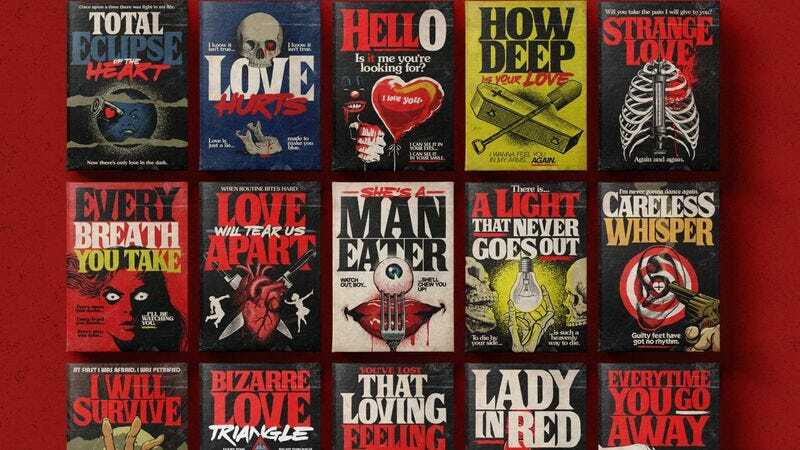 The concept is to look at the dark side of love through the lenses of pop culture, bringing twisted aspects of his classic stories to play with the original meanings of the songs—that can be completely subverted or strangely emphasized, while paying tribute to the vintage design of the original book covers. You can see all of the covers here, but here’s a few culled from Billy’s Instagram. “I Will Survive” certainly takes on a different meaning.